Home › News › Busiest Week Ever for Community First Volunteer Service! Subject: Busiest Week Ever for Community First Volunteer Service! October saw the busiest week ever for Community First’s Employee Volunteering Scheme. 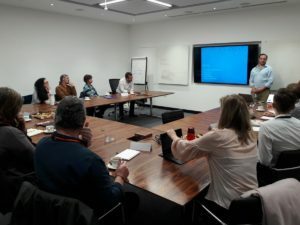 On the Monday, IBM ran a marketing workshop for local organisations with seven charities benefitting from their expertise in marketing including, the use of social media. The seven staff from IBM volunteered their time out of their busy work schedule. Wednesday saw St. John the Baptist School, Bishops Waltham, supported by a team from Peter Symonds College based in Winchester. 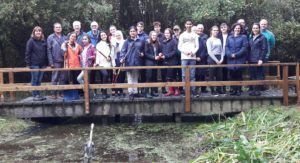 Despite the rain, they enthusiastically took on various conservation work in the school grounds including clearing a large pond area. 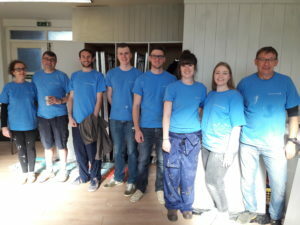 At the end of the busy week, Lockheed Martin UK gave up their ‘off Friday’ (they work their 37.5 hours over 9 days) to spend some time at Hewitt’s Community café in Emsworth. 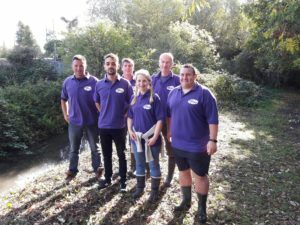 Debbie Lyall from Hewitt’s wanted the volunteers to makeover their garden, and paint and decorate their large hall and toilets.